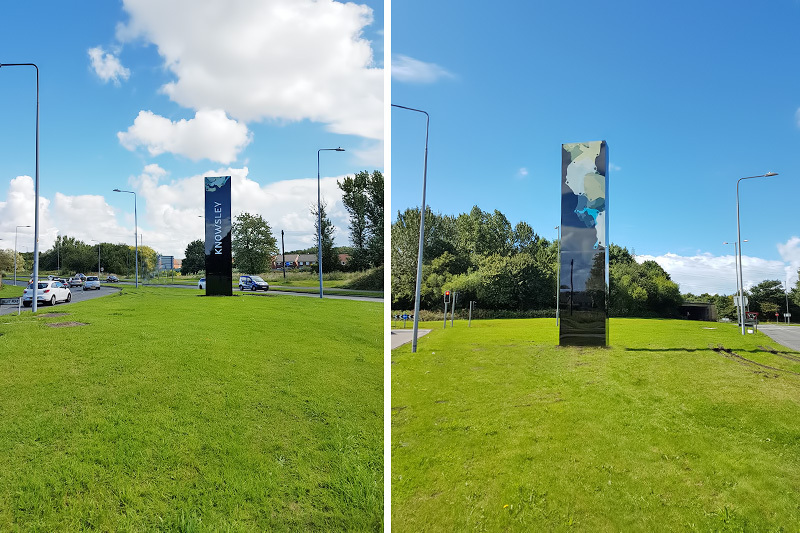 In September 2015 we were awarded the contract to supply Knowsley Council with 8 large monolith totem signs that would be installed in various positions around the boundaries of Knowsley Borough during 2017. 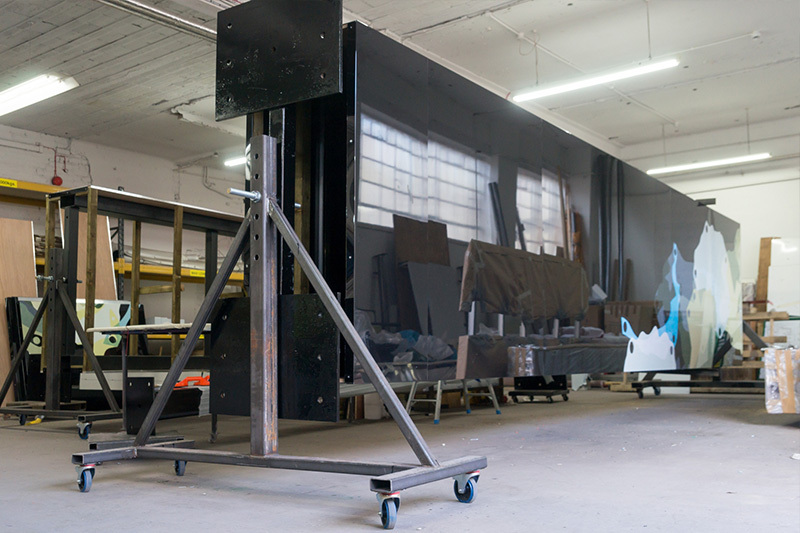 Prior to manufacture of the 8m x 1.8m x 750mm monoliths, our engineer and designers specified the dimensions of the inner steel frames that would serve as the main structure of the signs. 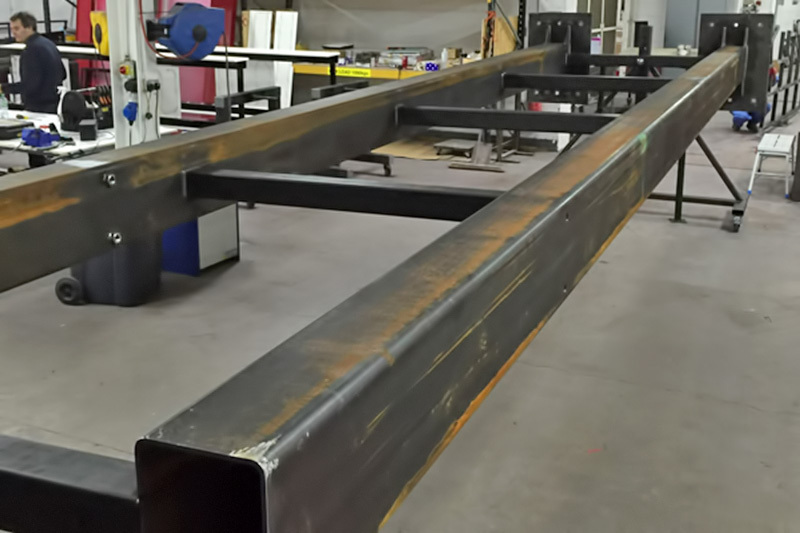 The steel frames were manufactured two or three at a time by our in-house specialist fabricators before being given an anti-corrosion coating. The whole structure was then fully clad with a ‘skin’ of 3mm black composite sheet to which digitally printed colour graphics and white PVC vinyl text had been applied. The surface was also fully laminated to provide further weather protection and durability. The signs proved to be quite difficult to handle due to their sheer size. They each were fully manufactured and assembled in one piece in our workshops demonstrating our capability to build several large, multiple units within our premises and be able to move them around on purpose-made jigs and steel trestles. 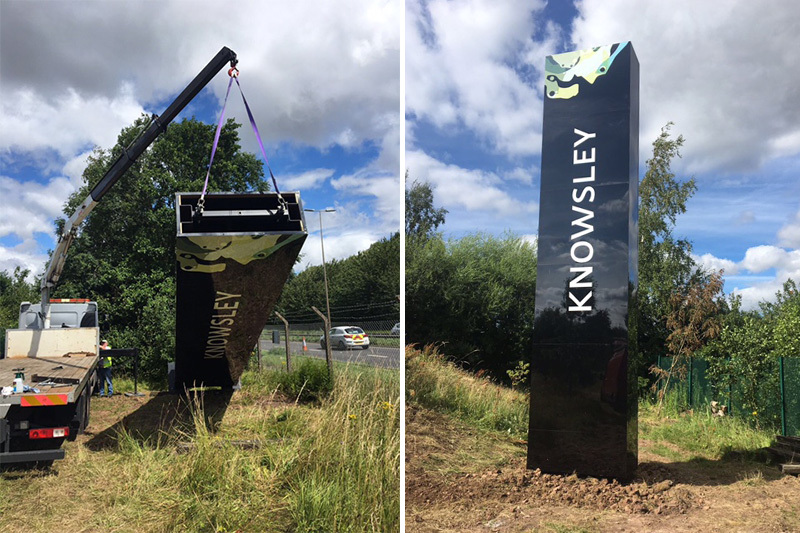 Benson Signs win tender to supply 8 large monolith totem signs for Knowsley Borough Council. Perhaps more challenging than the manufacture of the signs was the amount of planning and co-ordination that went into the siting and installation of the signs. Although our main client was Knowsley Council, our project management team had to liase with many different organisations/companies to agree permission for the signs to be fitted. These included private landlords for planning permission, 3 local councils, The Highways Agency, as well as organising traffic management which required road closures for the duration of the installations. The installations themselves eventually took place over a drawn out period between March and October 2017. 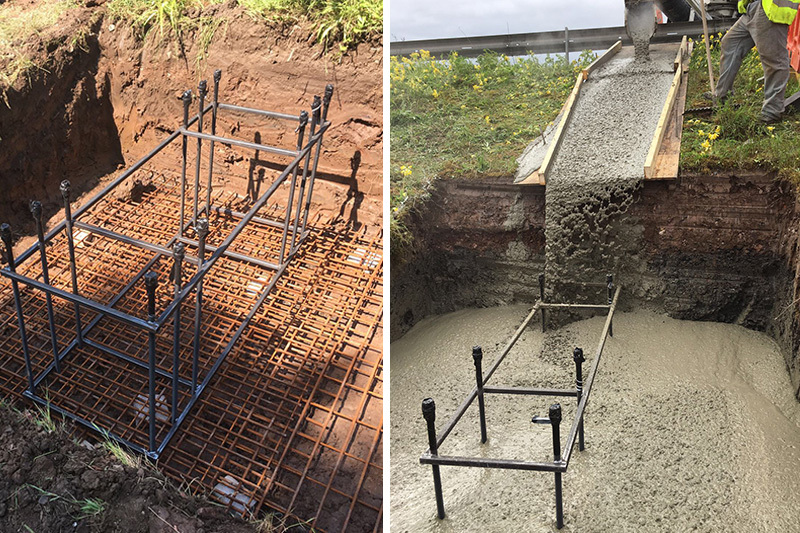 They typically involved the preparation of the suitable sized excavations, laying steel re-enforcement within the trenches and setting the studs and casting these within the concrete foundations. This work was carried out by our own specialist groundwork team several days prior to the signs being loaded onto a large HIAB lifting vehicle directly from our own workshop bay and then transported to site before being hoisted into an upright position and secured to the precast studs by our sign installation team. 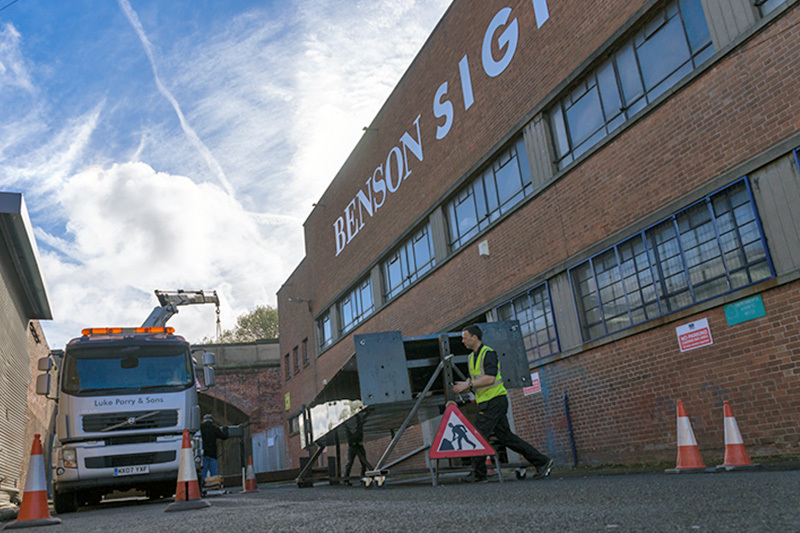 All of the signs were transported and lifted in this way except for one particular site which entailed lifting from an overhead bridge onto a Motorway embankment using a 35 metre crane due to access / lifting restrictions imposed by the position of the sign. We were happy to have been involved in this prestigious project and were pleased that with our meticulous preparation, smooth manufacturing and installation processes the work went very well and according to plan. The finished signs looked very imposing, rising from the ground beside some of the main roadways into, and out of Knowsley Borough.